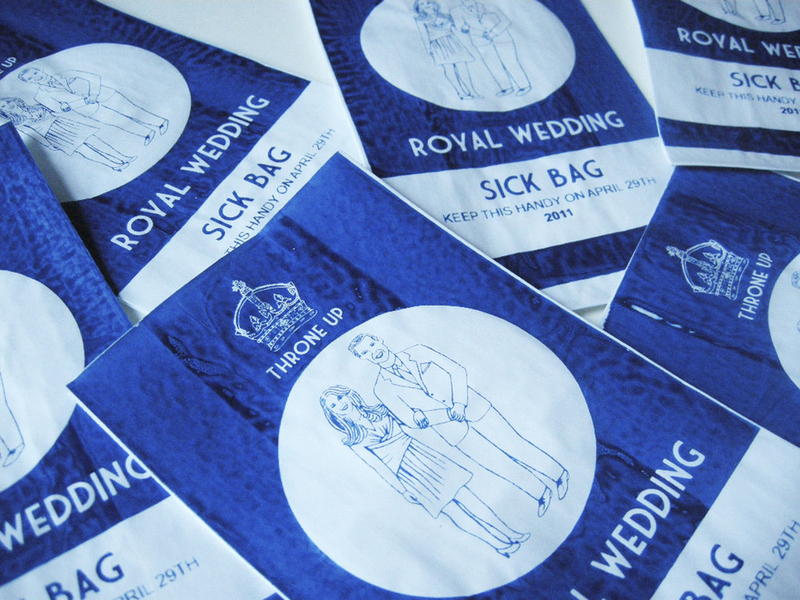 (CBS) If you're foaming at the mouth over the royal wedding - but because you're sick of it, not because you're loving every article and blog post - there's good news: You can get a royal wedding barf bag to help you cope. Graphic designer Lydia Leith has screen-printed sick bags that are selling in the UK for 3 pounds. At Friday's exchange rate, that's about $4.87. The Daily Mail reports that a first, limited edition of the "Throne Up" bag sold out quickly. The bags are available in royal blue and pillar-box (read: English post office box) red. Leith says worldwide shipping is available. The bags have an illustration of Prince William and Kate Middleton in the clothes they wore when they announced their engagement. Under that picture there's a warning: "Keep this handy on April 29th 2011." Leith tells the Huffington Post, "The bags are just a bit of fun, a sort of antidote to the hysteria surrounding the wedding -- I'm not an anti-monarchist in the slightest!"